Most villages have a small shop and all towns have at least one large supermarket where you can stock up on supplies. 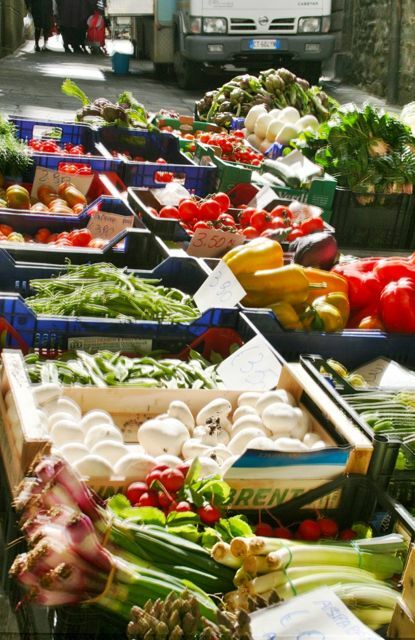 When staying in one of our villas in Tuscan or Umbria, it’s always fun to visit a local market and look at the colouful displays of fruit and vegetables. There are usually stalls selling pecorino (sheep) cheeses and salamis and the larger markets also have fish stalls. There are designer clothes shops in the larger towns, however, if you are a committed shopper you can go on a day trip to the designer outlets south of Florence. If you have time, Florence has an interesting leather market in the San Lorenzo district and a nearby indoor food market, recently revamped. Food Markets On The Tuscany Umbria Border – These close by lunchtime, so get there early! The Mall, Leccio, south of Florence (take the Incisa exit on the A1 south of Forence), lots of discounted designer labels. Valdichiana Outlet Village, less prestigious brands than The Mall. Near the A1 Bettole exit between Siena and Perugia.